This large male killer whale is like a big brother, cruising through the calm waters with a female companion like a real family man. The two whales seen here are traveling side by side in Queen Charlotte Strait, close to Lizard Point. It is quite common for a large male killer whale to travel close to his mother almost in a protective manner, like a family man. 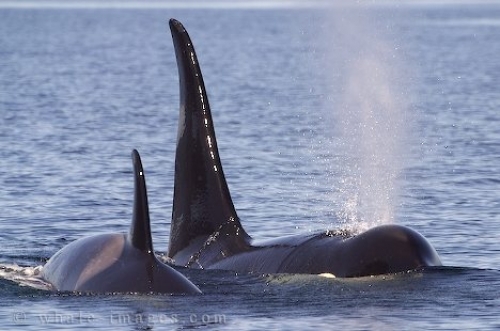 Picture of a female and male Orca Whale travelling together in Queen Charlotte Strait off Vancouver Island, Canada.